This penne is molto bene. This pasta dish parades through the Mediterranean and Mexico with cilantro, Greek olives, chile de arbol, and al dente penne. Salty and spicy, this puttanesca fiesta is kicked up a notch when Mexican chorizo joins the fray. Your taste buds will be on high alert in all the right ways. 1. Bring 4-6 quarts of water to a boil. Add salt to taste. Add pasta to boiling water. 2. 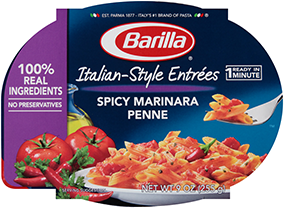 For authentic al dente penne noodles, boil for 11 minutes, stirring occasionally. Drain well. 3. Heat oil in a skillet over low heat, cook garlic until golden. 4. Add the Mexican chorizo until brown and crispy. 5. Add the tomatoes, and cook for 5 minutes. 6. Stir in the tomato paste, anchovies, capers, olives and the chile de arbol. Cook for 12 minutes, stirring occasionally. 7. Pour the penne in the sauce and stir. 8. Garnish with fresh cilantro leaves and serve.